We’ve said it before and we’ll say it again—maintenance software isn’t a magic bullet that immediately gets your work orders under control and reduces downtime. It’s a tool, and like any other tool, success really depends on how you use it. A big part of successfully implementing a computerized maintenance management system (CMMS) is making sure the right users are included in the system. It’s a no-brainer that your maintenance manager should be one of the users in your system. However, we know one common cost-saving strategy is for maintenance departments to only include their maintenance manager in the CMMS and just print out work orders for technicians. Don’t do this. You’re shooting yourself in the foot by not giving your full team access to your maintenance software. Paper work orders take longer to fill out, and this method means that someone is inputting that information in the system at the end of the day, rather than being able to log issues as they come up, and close work orders in the field. It lets you capture information from all corners of your business and analyze this data to help improve efficiency and productivity across the organization. 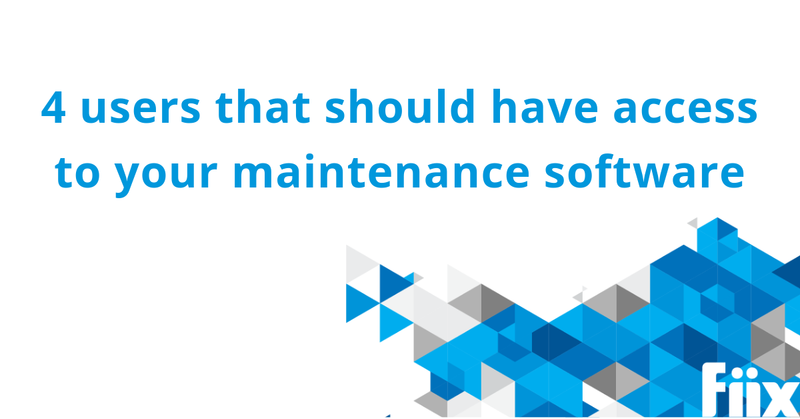 So which users should be able to access your maintenance software? Your maintenance team doesn’t necessarily work with the same equipment every day, but plant managers, line supervisors, and machine operators do, and they know what normal operating conditions look like. If you give operators access to a CMMS, it gives them the responsibility of cleaning, inspection, and basic maintenance. This means that small issues will be spotted and fixed a lot quicker, and it takes those small fixes out of the hands of the maintenance team, freeing them up for larger, skilled jobs. If you give CMMS access to tool crib operators and inventory managers it gives your whole organization a better way to keep track of inventory and tools. That way, when something does break down, you know where to find the right tools and parts to complete the job. Safety should be top of mind for all organizations, and keeping all your health and safety information in one system (and giving everyone access to that system) is a great way to cut down on safety risks at work. Your CMMS can help you track where your safety equipment is and what condition it’s in, and can help establish safety checklists and inspection rounds. Reliability engineers are another role that should absolutely get access to your maintenance software because they can take all that data that you’ve been collecting, crunch the numbers and turn it into actionable information. This can translate into less downtime, a more efficient maintenance department, and major cost and time saving, to name a few.